One more recent step to our wellness journey has been eliminating fluoride from our drinking water and toothpaste. I made this decision after some research, online testimonies, and after being involved with a community of wellness advocates. People who only want the best for themselves and their families, so they look into why we do things this way. To start off simply, imagine you are beginning your life and you were able to choose everything on a clipboard (oh what a thought!). When you got to the part that said "would you like fluoride in your drinking water?" Would you check "yes" or "no?" If your answer was something like "gosh I don't know, I've never thought about it!" then read on. Let me guess, you think it must be good for you if it is recommended by dentists in oral care, is used in regular check ups, and is put in our water without our consent. I was there, I had those passive thoughts kind of like ehhhh it must be fine. I also grew up drinking well water at my parent's house so I never really had to think about fluoridated water. Until I decided to read for myself. The day I stopped letting the general public tell me what is good for me, is the day I started seeing more positive results with my skin, energy, immune system, happiness, digestion, and hormones, among many other things. I am so grateful to have done this research. I am empowered with knowledge and with clean drinking water to flood my body with what it actually needs. For starters, flouride has been labeled by the MSDS as toxic by ingestion, inhalation, and by skin contact. They also recommend PPE when handling it. It does occur naturally but the synthetic version is inserted into our lives without us checking the "yes" box. It is a neurotoxin and flouride poisoning is lethal. We are ingesting it without our consent, (by we I mean more than half of America). The reasoning: to prevent tooth decay. I couldn't find much research to support this claim, but the thought of it is viral. So I'm sure someone will tell you that in small amounts it is ok. No thanks, that is not ok for me, my husband, or our future family. That is not how I treat my body. China, Japan, and many European countries have banned or rejected water flouridation. I could get on board for that! First of all, this is not to scare you, it is to inform you. We live a long healthy life when we make good choices for ourselves. There is freedom in knowledge, and there are easy solutions for us. We have to see the positives and keep a positive mindset and to be the change we wish to see. My husband and I started with what we could afford. Our toothpaste. We swapped it out for a non fluoride alternative. Funny enough, I had small annoying white spots on my teeth and a few weeks after the switch those were gone. My gums also looked healthier, that result was enough for me. This has been the best! We are so happy that we bought one and have felt the peace of mind knowing we are drinking filtered water and nothing else. 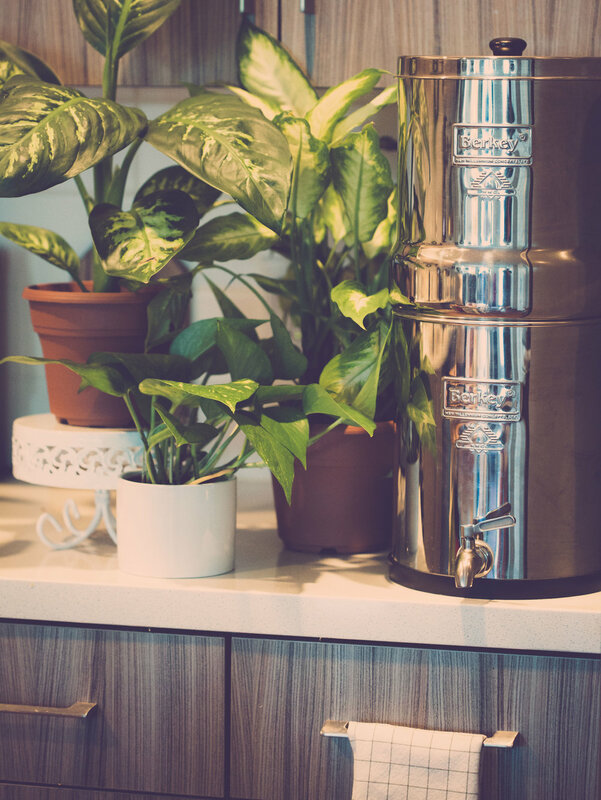 We looked into it and the Berkey filters, with fluoride add ons are amazing and effective at removing impurities, viruses, and that unnecessary fluoride. We couldn't be happier with ours! It sits on our counter and we fill it up almost every day. We both drink more water because of it and have never regretted this purchase. I have found another type of freedom in the past year and a half. And that is the freedom to choose what I want on and in my body. I call it "natural living freedom" and I am beyond grateful for it and for all of the companies that have this as their mission.